This was long before mobile technology had been invented. Phones were landline only and it was phenomenally expensive to phone overseas. In the first year I was away in Switzerland, I had one phone call with my mother and that was Christmas day. In Egypt, it was nigh on impossible to phone home. When I went to live there a few years later, the only way of phoning home was to do it through an operator at the post office. It cost a fortune and you had to queue for hours. Writing letters was the only real means of communication and what a slow process that could be. I’m sure my mother would have rested a lot easier in her bed if she had been able to contact me directly and vice versa. Today things are very different. Life for migrants can be tough. Feelings of homesickness can sometimes be overwhelming and being able to connect with friends and family can often be a lifesaver. Lebara are specifically set up to help migrants and to connect them to each other and to their friends and family back home. Lebara Mobile offer a free SIM with low cost international calls, no contract and no hidden charges. To enable migrants to help each other, Lebara to Lebara calls are free. And you don’t have to be coming to or leaving from the UK either, Lebara operates globally. My experiences of living and working abroad would have been very different if I’d had something like this at my disposal. Part of the founding ethics of Lebara is to give back to the communities that migrants come from. Through the Lebara Foundation, a proportion of the company’s profits are donated to help displaced communities around the world with housing, health and schooling. You can read about some of the people that have been helped on the Lebara site. This has particular resonance at the moment with the devastating earthquake in Napal which has displaced so many people. I loved Egypt and didn’t feel homesick as I was only there for a short time, but I desperately wanted to communicate the exciting discoveries I was making. Life in Egypt was a very different thing to life back home in Cornwall. As for the food, it was a revelation and I fell in love with it immediately. It was here I had my first taste of hummus, felafel and shakshuka. Despina, the matriarch of the family I was staying with was probably the best cook I’ve ever come across. We had big sit down feasts of Middle Eastern cuisine every single day. As for the pastries, they were a complete wonder; spiced nutty Baklawa soaked in rose scented syrup, crumbly crunchy kunafa and the best nougat I’ve ever had anywhere. However, the one I got the most excited about was a plainer less well known cousin, Basbousa. This is an Egyptian semolina yogurt cake doused in rose and lemon syrup. The reason I was so excited was that the pastry shops sold it with a rectangle of what seemed suspiciously like clotted cream. Cornish clotted cream in Egypt? I so wanted to exclaim to my mother the first time I discovered it, but that immediacy was not to be. 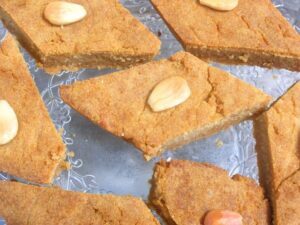 This recipe for Basbousa is less sweet than those I used to eat. I just can’t bring myself to apply the copious amounts of sugar stated in all the recipes I looked at. It is, nonetheless, a rather delicious sweet treat. I used kefir rather than yogurt, but this is the closest to the cakes I remember from all those years ago and had the same dense consistency and squiggly top. The flavours of lemon, rose, honey, cardamom and cloves combine to make a flavour reminiscent of Egypt at it’s best. Of course I had to have a slice topped with a dollop of Cornish clotted cream – for old times sake. 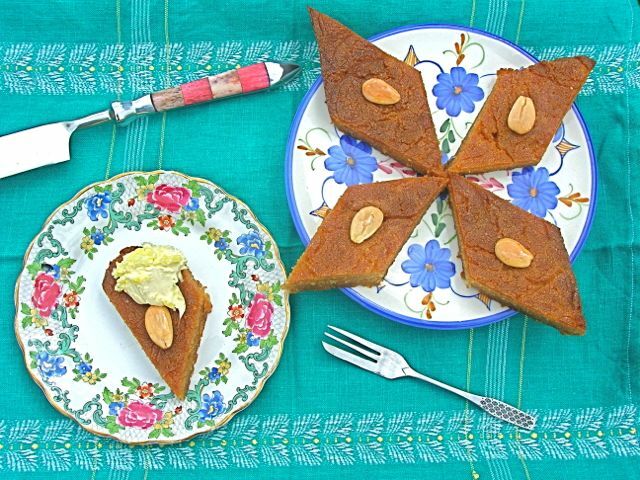 This Egyptian classic, is a dense semolina yoghurt cake flavoured with burnt butter and honey and doused with rose, lemon and cardamom syrup. Simmer the butter in a large pan for a few minutes until it starts to turn brown (be careful not to actually burn it). Add the semolina and continue to cook over a low heat, stirring occasionally, for about 10 minutes. Remove from the heat and stir in the yoghurt, followed by the bicarbonate of soda. Pour into an 8" (20 cm) sq silicone mould (or lined tin) and leave for an hour or more to firm up. Cut into diamonds and place an almond on the top of each piece. Bake at 180℃ for about 30 minutes, when the top should be nicely brown, but not burnt. Whilst the cake is resting, dissolve the sugar and honey in the water over a low heat. Add the cardamom and clove and simmer for about 10-15 minutes or until the syrup has thickened. Add the lemon and rose extract and pour over the hot cake. Leave in the mould to cool and the cake will soak up all of the syrup. It's really worth persisting with the first stage of browning the butter as it adds lovely nutty notes to the cake and gives it a nice colour. Excellent served with clotted cream. Bintu over at Recipes from a Pantry has also written a post about Lebara from her perspective of moving to the UK. This is a sponsored post. However all opinions are my own and I believe Lebara are definitely worth knowing about. I like this post and hearing about your adventures very much. How brave you were. I wouldn’t have been that brave. The basbousa sounds like something I would like very much. Ah, thanks Kath. I don’t think I’d be as brave today, despite the wonders of mobile technology. I love hearing about different people experiences of moving to the UK and I would have loved to meet Despina and learnt some recipes from her. Luckily nowadays it is easy to call home or our Despinas via Lebara. Thanks Bintu, communication is so much easier now thanks to the likes of Lebara. Thanks Vaishali, it’s very different from a sponge cake, but really good in its own right. That is so true Janie. I’ve lost touch with just about everyone too and it would be fabulous to find out how they all are and what they got up to. oh for those days of freedom and adventure! It all seems much more complicated now, but I do agree about the phone calls, you just didn’t call abroad unless it was an emergency. It sounds like Lebara has made things a lot easier. It’s a very easy cake to make Hannah – always a big plus. Oooh, that Basbousa sounds lovely… I’m not very adventurous with puddings but may have to send this to my Mum for her to try out! I would have loved to have lived abroad, but in the grand scheme of things I am a homebird and now I have no desire to even holiday abroad. Haha, I know what you mean Beth. We always go on holiday in Cornwall these days – not even leaving the county. How unadventurous can you get? For years I’ve had a Lebara card, to phone family and friends in Europe. AMAZING value and charges are barely more, if not less, than phoning UK mobiles! Gorgeous recipe too by the way! Thanks Lou, it’s good to hear from someone who uses Lebara and I’m really pleased to have found out about it. Basbousa…what an artistic name for a simple sweet treat. The cardamom syrup sounds really intriguing. Thanks Angie. Basbousa is a great name to say – love it. And the syrup is much more complex than the average and consequently rather good. I have enjoyed similar cakes to this from the Lebanese shop I had at the end of the street in West London. They’re delightfully sweet and sticky! Haha Sarah, yes they can be. Mine is deliberately not too sweet and surprisingly not that sticky given the amount of syrup I poured over it. Lovely recipe and that is true, Lebara is worth knowing about, saved me lots of money when I needed to call my mum daily in Poland for the last couple of years. Fabulous cake which I’ve not heard of before but now I have Kate Bush’s Babouska going around my head! Haha Camilla, I’m going to be bursting into song every time I say basbousa from now on in. That looks mighty moreish to me. ahhh, the glamour of international travel!… I had to explain to someone (younger than me) what inter-railing was the other day. Love these treats but then anything with this amount of honey is OK by me! Ah yes inter-railing – the upmarket version of hitchhiking 😉 When did that stop? Honey just makes everything better.